Our Talmud, our learning, has taught us much about humanity, how things are, the history of Judaism, of life, of what is and what should be. We learn about relationships, about Leah, Rachel, and Rebecca, their hardships, the negatives and positives in their lives and much more. We learn about jealousies, anger, and misplaced anger, competitiveness, preferences, injustices, and more. Crimes are committed because of feelings of inferiority. One such example is the story of how Joseph was thrown into a deep hole in the earth because his brothers were jealous of him because they felt and believed that their father preferred Joseph. They were happy to kill him without mercy to be the special one . They were narcissists and thought only of themselves, and did not consider the life of others. They were the forerunners of Hitler and other killers who did not care about other human beings or their rights, or even their lives. Mothers are frequently the scapegoats of misdeeds of their children and they become the innocent victims of angry and jealous daughters-in-law who attribute all evil to the benighted victim, their unfortunate mother of their son. Often the mother holds herself responsible for anything and everything that occurs, as can be seen in the story of Samson. When he was a young boy, his mother tied him to a table leg while spanking him with the words: "Beni Mein Sohn, wenn du wirst schlecht sein wird mir die Welt die Schuld geben” (Listen my son, if you are evil the world will hold me responsible for your actions). In our modern world there are countless causes, reasons, desires, temptations, and actions to create disturbances. All parents, especially G’d fearing Jewish parents, attempt to be good role models for their children. For the most part parents have it within their power to teach the child right from wrong. Most of them attempt to have kind, loving, righteous children who will become normal people, good citizens, and adherents to the ten commandments. Because of the many contacts they will have, there will be innumerable opportunities to have connections with the “outside” behaviors and world. It is obvious, however, that the straight and narrow path individual is frequently not rewarded, and the clever, frequently dishonest, politician wins. The growing son or daughter may want to imitate the “winner” and cast away his or her family's teachings. The environment outside of the home, friends and acquaintances, the drug culture, the temptation of modeling “the happy people,” and the ease of dropping/discarding the difficulties that the religious, the Jewish, and straight path costs may lead them away from their earlier learning. In marriages, the wife or girlfriend will have so much influence that she convinces her partner that his parents, especially his mother, is evil and selfish (she projects her ill feelings unto the “mother- in-law”). Sexual gratification is very important in a partnership/marriage. Therefore, the angry, embittered “spouse”/partner projects all of her disappointments on the silenced mother, who wants her offspring to live in peace. The story of Ruth and Naomi should be read by every belligerent would be daughter-in-law, that she may be reminded to bring joy and not hatred to the woman who gave birth to her husband. 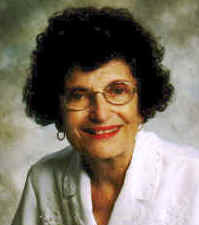 Dr. Ursula A. Falk is a psychotherapist in private practice and the author of several books and articles.